TORONTO -- A recent decline in global stock prices may be an opportunity for the Canada Pension Plan Investment Board to get better prices for investments it wants to make, CEO Mark Machin said Friday after releasing CPPIB's quarterly results. "Our portfolio is constructed to be robust and perform well in the long term. So we're well set up to weather this type of volatility," Machin said after announcing the CPP Fund earned a four per cent return in the quarter ended Dec. 31. Besides having a widely-diversified portfolio and a very long investment horizon that protects the CPP Fund from short-term volatility, its investment teams see periods of stock market weakness as opportunities. "This allows us to enter at a better price than we would otherwise. So that's good," Machin said. He also said the market volatility -- indexes have made huge swings in both directions this week -- reflect a debate about whether rising U.S. wages and interest are a threat to the economy or a result of economic strength. "So we have a battle between the optimists and the more cautionary people within the markets," Machin said. But Machin said he wasn't surprised that there's been a dampening of the "euphoria" that stock markets experienced in the early weeks of 2018. He predicted in late January at the World Economic Forum in Davos, Switzerland, that a selloff of U.S. government bonds -- because of rising interest rates and inflation -- could trigger a re-pricing of all assets. That's exactly what happened, he said, when a report on U.S. wage growth on Feb. 2 triggered inflation fears and a drop in 10-year U.S. bond prices. "I can't say that I'm happy to see it but the logic that I mentioned then played out on Friday last week and coming into this week," Machin said. As for the CPPIB's investment performance in its fiscal third quarter, ended Dec. 31, Machin said the results were "quite solid" and the fund reached a record high value of $337.1 billion, up from $328.2 billion at Sept. 30. "We had strong performance around the world," Machin said. 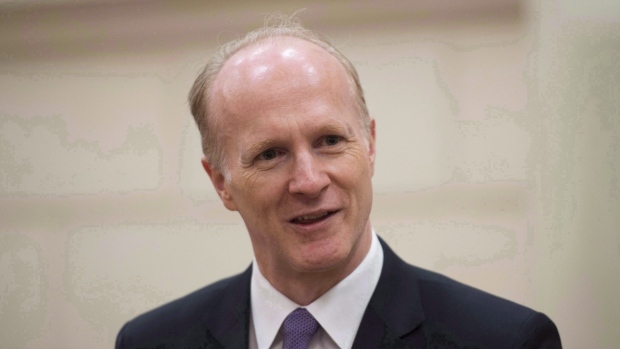 He also emphasized that the fund's five- and 10-year performances are the most important metrics and they were above the level that the Chief Actuary of Canada says will meet the fund's obligations for at least 75 years. CPPIB's quarterly report said the three-month increase ended Dec. 31 reflects $13.1 billion in net income after costs, less $4.2 billion in net Canada Pension Plan cash outflows. The fund routinely receives more CPP contributions than required to pay benefits during the first part of the calendar year, partially offset by benefit payments exceeding contributions in the final months of a calendar year. For the nine-month financial year-to-date period, the CPP Fund earned a net return of 6.7 per cent after all costs during the period. CPPIB invests CPP assets that aren't needed to pay pension, disability and survivor benefits.